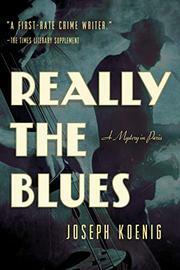 A sweet gig at a Paris jazz club gets bollixed up when the drummer and his gal commit suicide...or was it murder? Even though the United States has not yet entered what will become World War II in 1941, the occupied city of Paris hardly seems like the perfect spot for an American jazz musician. But trumpeter Eddie Piron likes it just fine. He isn't political enough to care that he's a big hit with the Nazis at La Caverne Negre. Not so Danish drummer Borge Janssen, who abruptly decides to quit, cutting the combo down from seven to six. Make that five when Janssen's punch compromises Eddie's lip for a while. Shortly after, a pair of grim cops comes to question Eddie, telling him Janssen has jumped off a bridge to his death. It seems like suicide until Eddie learns that Janssen's live-in girlfriend, Anne Cartier, recently died by putting her head in the oven. Official investigators Maj. Weiler and Col. Maier have a considerable file on Janssen that includes allegations of subversion and violence against the German nation. As Weiler and Maier proceed methodically through their investigation, Eddie, band mate Weskers and club manager Roquentin evince a bit more internal tension. Thad Simone, an avid new fan, is not who he appears to be—but then, that also might be said of Eddie. And then there's the seeming reappearance of Anne Cartier, just a step ahead of Maier and Weiler. Grounding his subtle and complex thriller in rewardingly nuanced characters, Koenig (False Negative, 2012, etc.) creates an atmospheric world and delivers a series of satisfying surprises.